PORTLAND, Maine — A National Guard proposal to expand airspace for fighter jet training low over the mountains of western Maine has dragged on for so long that many of the aircraft currently used for training could be retired by the time the plans are completed. 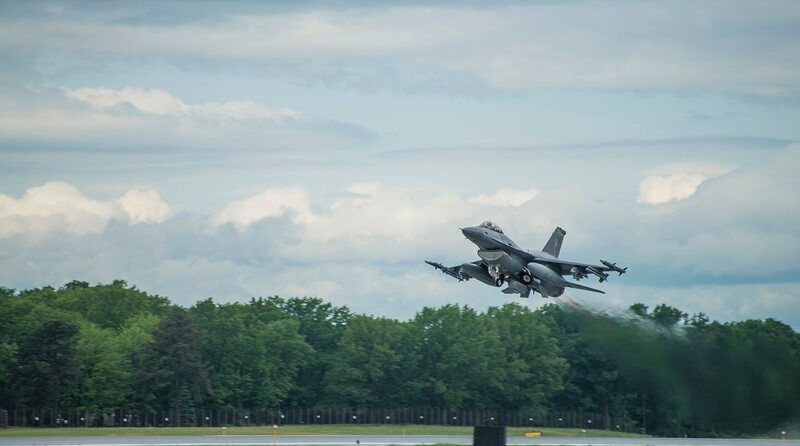 Vermont-based F-16 fighters account for the bulk of the training flights and are due to be replaced by stealthy F-35 fighters that figure into the National Guard proposal to hold training exercises over a larger area. F-35 fighters aren’t allowed to fly low to the ground, and the guard says its plan would cut the number of low-flying jets by more than two-thirds each year and mean less noise from aircraft screeching overhead. “I can’t guarantee someone that they won’t hear an airplane, but I can guarantee that they won’t hear it consistently,” said Jamie Flanders, airspace manager. But a former fighter pilot instructor warned there are no guarantees on numbers of fighters using the airspace if the changes are ultimately approved. They’ve been in the works for 14 years. “It could turn into an air warfare center for the entire East Coast. It would not be good for western Maine, for anyone who’s concerned about the pristine environment and quality of life in that area,” said retired Lt. Col. Mike Wells, who lives in Wilton, Maine. Under the proposal for the 4,000-square-mile Condor Military Operations Area over Maine and part of northern New Hampshire, pilots could fly low over the entire area instead of along existing, narrow corridors. The Air Force delayed the process again by ordering a revised environmental impact statement aimed at ensuring alternatives were adequately explored and documented. That will likely push final action to 2019, the year the F-35s are due to be delivered to the Vermont Air National Guard. Once that happens, the older F-16 models will be phased out. The Air National Guard will hold additional public hearings once a thorough assessment is completed, Flanders said. State Sen. Tom Saviello, a Republican from Farmington, said he hopes the military does a better job than last time in explaining why the changes are needed. The last effort was fraught with problems and did little to earn the confidence of residents, he said. “This is my take: If any pilot’s life is saved because of this training, then I’d support it. However, I want them to do this right,” Saviello said. The Massachusetts Air National Guard, whose fighters were the first over New York in the Sept. 11 terrorist attack in 2001, contends it needs additional low-level training over mountainous terrain for its twin-engine F-15 fighters to ensure pilots are prepared to defend the Northeast. Those F-15 training sorties amount to 72 per year, compared with 324 by the Vermont National Guard F-16s that are being retired. Nonetheless, critics like Toni Seger remain concerned about disturbances caused by military jets in a part of the state that depends on tourists and second-home buyers looking for peace and quiet.